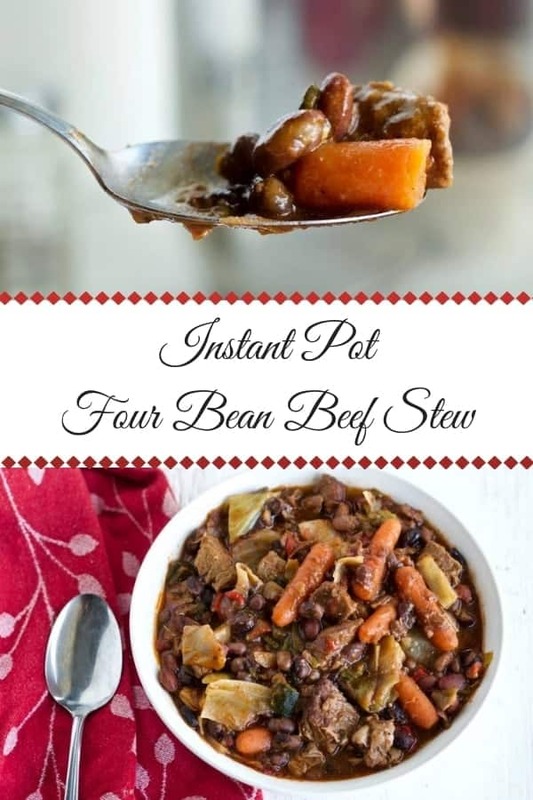 Instant Pot beef and bean stew is an easy one pot meal. 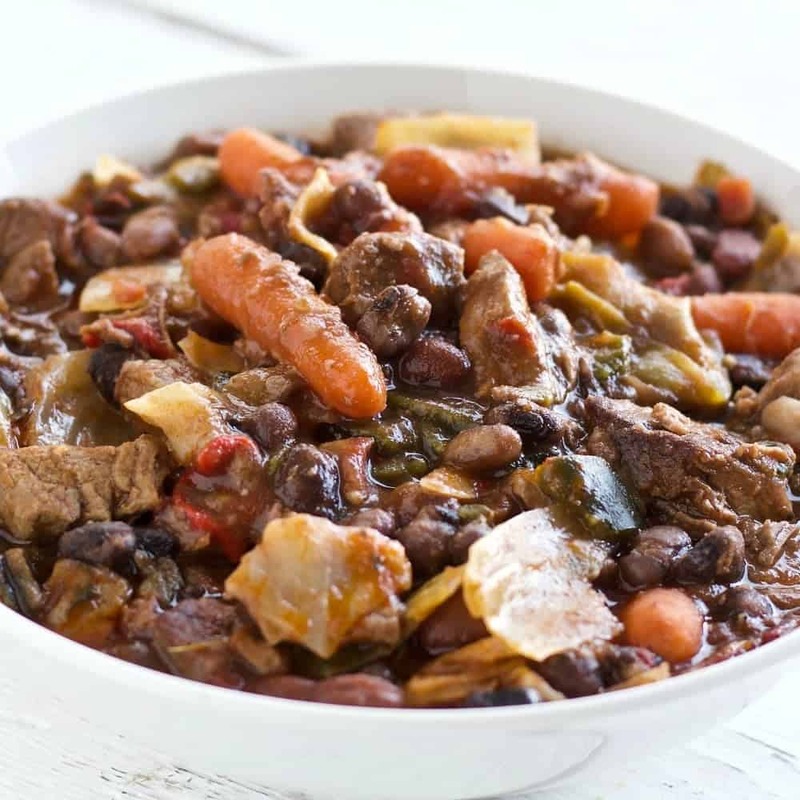 This filling and delicious Four Bean beef stew is full of rich flavor, fiber, protein and nutrients. 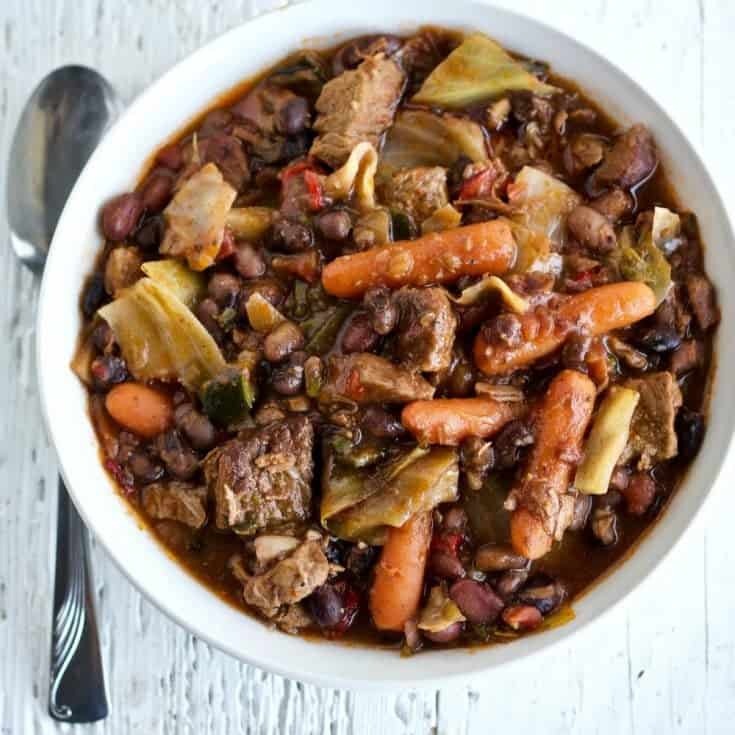 Instant Pot Four Bean Beef Stew with four kinds of dried beans, roasted peppers, Beef, cabbage, carrots, garlic and cabbage. This easy dinner is wonderfully simple to make in your instant Pot. The instant pot saves hours of stove time too. Hearty winter stews like this one are SO much simpler when made in your electric pressure cooker. If you love your instant pot and want more recipes for it. Go to our instant pot section here. The Instant Pot is bringing dried beans recipes back into my kitchen. I can now cook them up from UNSOAKED to perfectly done cooked beans in about a half hour. No pre soaking. Not Kidding! Soaking the beans is a deal breaker for me. I just never remember. Cooking dry beans for hours on the stove top is NOT what I want to spend my day doing. How bout you? But much faster cooking time is not the only reason to make dried beans recipes in your instant pot. Pressure cooker beef stews maximize the healthy nutrients in your beef stew meat recipes and save a few bucks. Win Win! Our Instant pot six gun chili recipe and Instant pot bean and sausage soup recipe also use unsoaked dried beans that are completely cooked in the instant pot in 30 minutes or so. 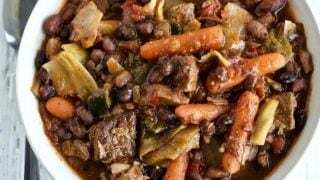 Make your beef stew bean recipes into Instant pot dinners. Meaty bean stews just got a LOT easier. Dried Bean recipes are VERY healthy for you and make a dynamite bean stew recipe. 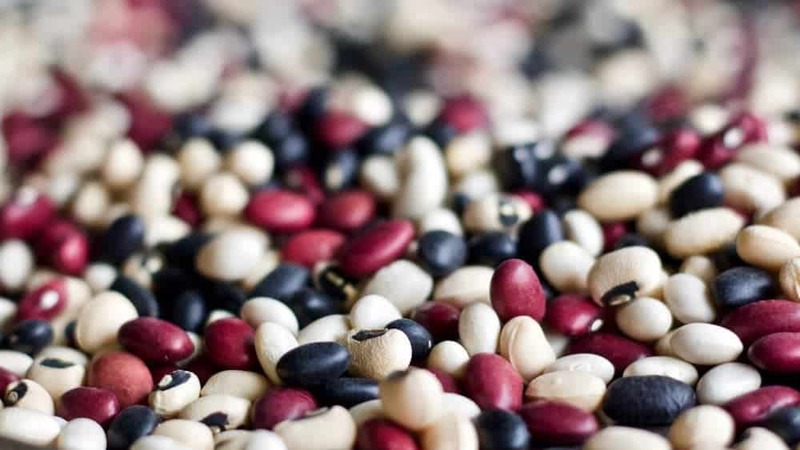 All Beans are full of healthy carbs with a TON of fiber and nutrients. Adding beans to a hearty stew makes a lot of sense. We ate this stew with NO other carbs. It really is tasty, healthy and filling enough to stand alone as your lunch or dinner. This article by SFGate explains why dried beans are better nutritionally than canned. Mostly it’s the salt. Canned beans have lots of salt. Especially if you don’t drain and rinse them (which I don’t). They also lack a few other nutrients that dried beans contain. Cook dry beans in your electric pressure cooker! One more thing about this new frontier of cooking. I’m making my OWN dried bean blend. It’s easy to mix up your family’s personal favorites. I just bought a bunch of different beans of about the same size and put them together into this pretty mix. Just mix them together in a ratio of 1:1. I used small red beans, black eyed peas, black beans and navy beans for my mix. They are ready to cook! All you need to keep in mind is your beans in your personal blend should have about the same cooking times so they come out of the instant pot perfectly cooked. Turn this recipe into Instapot beef bean soup. Simply reduce the stew meat chunks to a small size that will fit handily on a spoon. Then dilute with more liquids to your desired soupy consistency. Here’s How to cook beef stew in the instant pot. IT”S SO EASY! After you finish cooking the beans remove them to a separate bowl. use the saute function and brown the beef chunks with the beef stew seasonings. Set the pot for stew and go take a break. Instant Pot Four Bean Beef Stew. I love the glass lid for saute and storing leftovers. 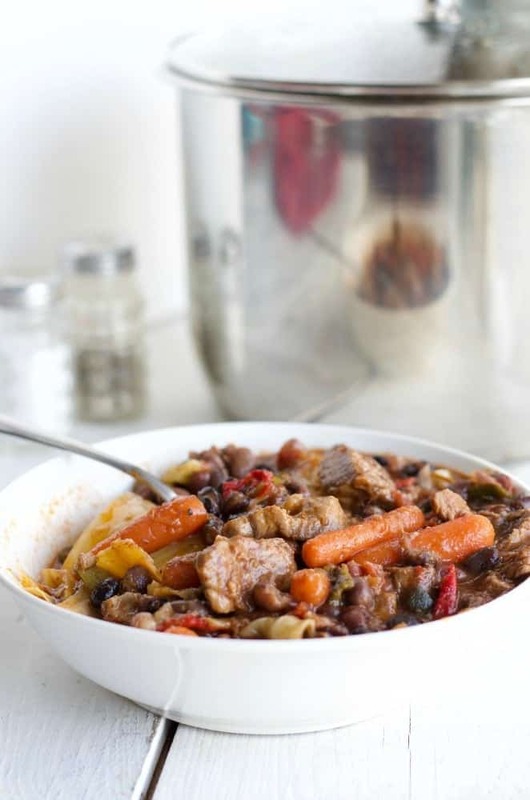 Instapot Beef Stew is Full of chunks of delicious, hearty beef. This recipe has 42 % of your daily protein needs in just one meal. It also accounts for 20 % of your carbs. Beef stew ingredients are all pretty healthy if you keep the sodium content down. So look for low sodium cans in you worry about that. And the dry beans will reduce the sodium in this recipe a lot. Just don’t add extra salt while cooking them. But they are really healthy carbs with LOTS of fiber that will do your body good. All that and it’s naturally low in fat too. Win win! I bought my 6 quart DUO Instant Pot and then I bought a Glass Lid. I love using them together for saute’ and slow cooking. The glass lid also makes storing the leftovers in the fridge a breeze. I’ve linked some of my favorite instant pot accessories below for you. 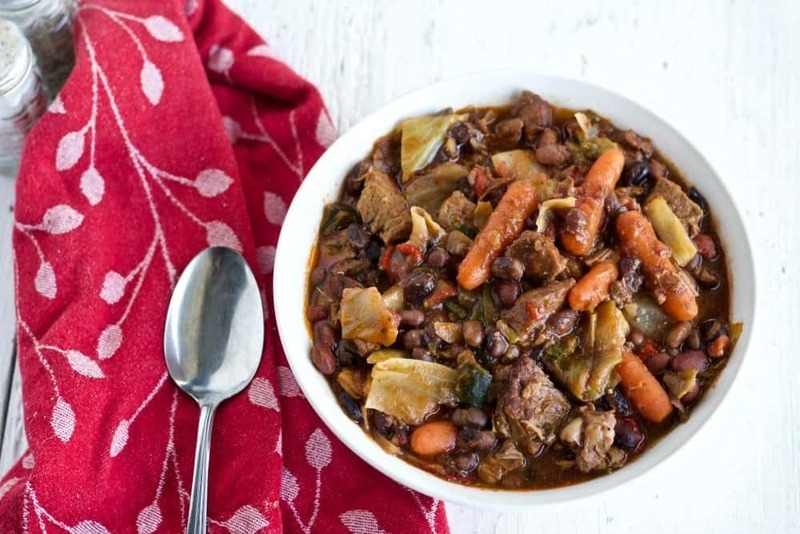 Instant Pot Four Bean Beef Stew with cabbage, carrots and roasted peppers. This is a great flavor combo! This is NOT a set it and forget it recipe. This recipe is done in a couple of different stages. But it is an easy beef stew. Promise! The Instant Pot will take good care of you. Each step is no fuss and you will have lots of down time to do other things with your day. I put approximate times into the different stages. As you can see this instant pot beef bean soup recipe goes pretty quick with lots of rests for you. Enjoy. Pour the oil, beans and water into your instant pot. Seal the lid and press the BEAN function key. Set the timer for 25 minutes. Pour the beans into a bowl retaining the cooking liquid. Set bowl aside till needed. Rinse the instant pot cooking pot and dry. Set the pot to saute, pour in 1 Tablespoon avocado oil and the stew meat. Season to taste with the Montreal seasonings and cover with the glass lid (If you have one). Once the meat is browned (about 15 minutes), turn off the instant pot. Add the remaining ingredients(except the cooked beans). Put the pressure cooker lid on and seal it. Press the meat button. It will automatically cook for under pressure for 20 minutes. Once the instant pot is done push the off button and Quick Release. Open the lid and pour the cooked (still warm) beans into the pot. Stir and serve. homemade food? what and where is your “homemade” montreal seasoning recipe? I’m a 70 year old foodie that somehow missed that one! seems key to your recipe but so far I have not found it, HELP. Hi James, I’m sorry you are having trouble finding Montreal Steak Seasoning. It’s very common in the grocery stores around me. You can make it yourself if you like. Here is a homemade Montreal seasoning Recipe for you to try. I have also included an Amazon affiliate link to McCormicks Montreal Steak Seasoning if you prefer to buy it and can’t find it locally. I use the big costco jars so I ALWAYS have some on hand. It’s a great seasoning for many recipes. I hope this helps you out! Have a great day! thanks for your VERY prompt responce! I’m cooking this dish today and expect a great outcome. Wonderful James, Please let us know how it goes for you. Hope you found the Montreal Steak Seasoning. SO…how did it go James? Were you able to overcome your seasoning deficiencies, and utilize the super-nice response from Diane? It seems that she was able to locate a makeshift Montreal steak seasoning recipe by using the internet. Seems like your overly-aggresive comment and her absolutely amazing response was rather telling. How did the dinner go?!?!?!?!? I’m taking care of Tommy for a month while his wife, Nok, is in Thailand. I just bought a pressure cooker, so I think next Friday, I’ll start using your recipes. This one, the Four Bean Beef Stew, seems easy enough. I’ll let you know how I do. Hi Susie, All our best to you and Tommy. Did you buy an instant pot? Our Instant pot pressure cooker recipes work really well in that but I can’t vouch for other canning type pressure cookers. Let me know what you have and I’ll steer you to the right recipes. Hugs from big sister! Thank you so much Angie, I’m delighted to join your party.